Any quantity only $11.99 per bar over spot! If you follow the 12-year cycle of the Chinese Lunar Calendar from its official start to finish, you’ll follow the animals from the Year of the Rat at the start to the Year of the Pig at the conclusion. The penultimate animal in the cycle is the dog, with the Year of the Dog landing 11th in the cycle. 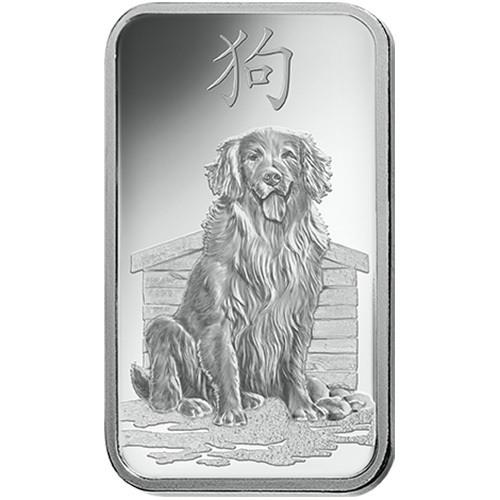 The 10 Gram Silver PAMP Suisse Lunar Dog Coin is currently available to you for purchase online at Silver.com. Ships to you inside of protective plastic with a sealed Assay card! 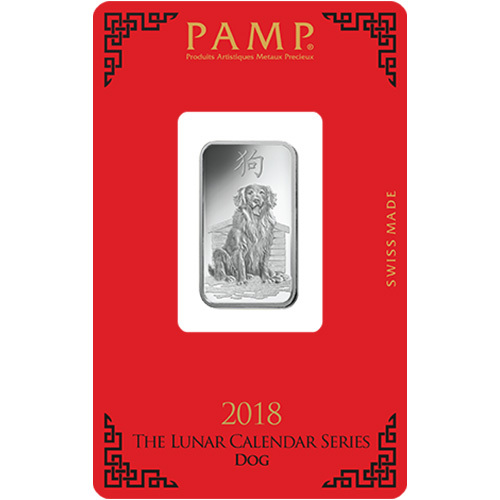 Produced by PAMP Suisse for the Year of the Dog in 2018! Consists of Ten Grams, or .3215 Troy ounces, of .999 fine silver. On the obverse is an adult dog sitting near its doghouse. The reverse side reveals a young puppy in the door of the doghouse as viewed from behind. Suitable for Precious Metals IRAs. Like the creatures themselves, those born under the sign of the dog are loyal, faithful, and honest, though distrustful and capable of telling the occasional white lie. These individuals can prove temperamental and undergo mood swings. Sensitive individuals, those from the Year of the Dog excel in business but often struggle in love. The Year of the Dog design in the PAMP Suisse Lunar Collection is one of the many to feature the stunning front-back designs that reveal something more to the scene when you view the reverse side. All of the bars have opposite front-back designs with the same image, but the Year of the Dog and other later issues have more to the reverse design than a simple change of angle. 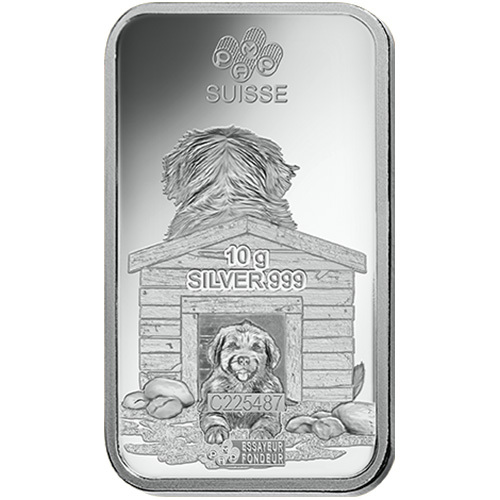 On the obverse of 10 Gram Silver PAMP Suisse Lunar Dog Bars is the image of an adult retriever sitting in front of a doghouse. The animal blocks most of the view of the doghouse and is accompanied by an engraving above its head of the Chinese symbol for the dog. The reverse of 10 Gram Silver Lunar Dog Bars includes a little more to the design than you might have expected viewing just the obverse. From this side, you can see the back of the adult retriever and more of the doghouse. As such, you’ll notice there is a small puppy laying in the doorway to the doghouse. 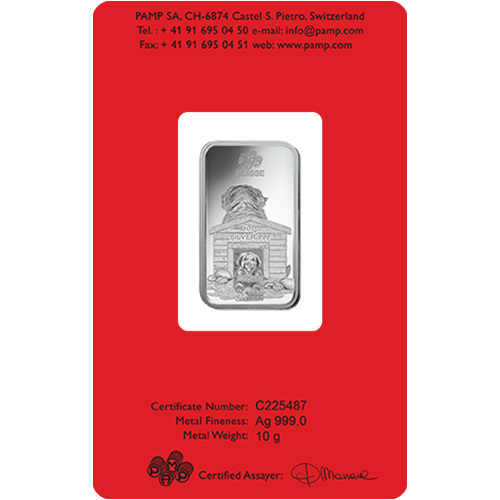 These 10 Gram Silver PAMP Suisse Lunar Dog Bars are available to you with protective plastic packaging and are sealed with a red Assay card from PAMP Suisse. The use of red Assay cards is fitting to the Lunar Collection as Chinese tradition includes gifting money in red envelopes to friends and family at New Years. We encourage Silver.com customers to call us with questions about buying silver at 888-989-7223. You can also reach out to us online through our live chat and email address features.